Where does the story of Jimmy and Laura start? JR: We met at Sheffield University where we were both doing an MA in journalism. I think the first time we spoke properly was in a pub called The Hadfield when we were put together as doubles partners in a game of pool. I genuinely still remember the shot I did to win us the game. LT: That was my first glimpse into Jimmy’s competitiveness, which I’ve subsequently witnessed during table tennis, shithead, Just Dance and writing books. When did you decide to write books together? LT: A group of us from the journalism course stayed friends, so we were still hanging out a few years later when I was writing the Girl About Town column for the London paper and Jimmy was writing a dating blog which had gathered quite a following. We found ourselves really enjoying each other’s work. Aside from making me laugh, Jimmy’s blog gave me a great (and somewhat distressing) insight into the male psyche and we thought it would be interesting to do something from two different perspectives. JR: When Laura got approached by a literary agent I upped the frequency of ‘I’m loving your column’ emails and started taking wine and biscuits with me when I visited. That was enough for her to let me ride on her coattails. What was your journey to getting published like? JR: We couldn’t have done it without the aforementioned agent, Lizzy Kremer. A few months after we signed to her we sent her a few chapters and she pretty much said they were rubbish. I still think that version was funny – we’d crowbarred all our favourite lines and jokes in there – but like a lot of initial attempts at a first novel, there was little thought about plot and character. Anyway, Lizzy set us in the right direction and we got to the stage where she was sending the manuscript to publishers. LT: It’s weird to look back at the early days. We’d be sitting there late at night, thousands of words in, reading it over and over, tweaking it, rewriting whole sections, and then one of us would turn to the other and say: “Just think... there’s quite a high chance this will never get published and it would have all been a massive waste of time.” And then we’d turn back to our laptops and pretend that wasn’t true. We must have believed it could happen to put the work in that we did, but then when we were offered a book deal, it felt ridiculously surreal. JR: The second person I called, after Laura, was my mum back home in Lincolnshire. It was about 2pm and I’m pretty sure that by 2.45pm there wasn’t a person in the entire county who she hadn’t been informed that I’d got a book deal. Do you have any top tips for aspiring authors reading this blog? JR: If you’re an aspiring author you probably still have a full-time job, so I’d suggest trying to wangle a desk at work where people can’t see your screen. Also learn the Ctrl-tab shortcut so when you’re working on your manuscript in the office you can flick to another document when anyone comes along. LT: Find a quiet place to work in. If you’re anything like me, you won’t properly settle down to work while you’re surrounded by distractions, so I’d end a ‘whole day of writing’ with just a few hundred words on my screen, but a spotless house, a couple of episodes of True Blood crossed off and an extravagant dinner on the table for my housemates. I’ve since turned a shed at the end of my garden into my office with no TV, no fridge and a poor phone signal, and it’s much easier to write than at the kitchen table. You previously said that the way you write books together is that one person writes one chapter and then passes it to the other person to add a chapter, and so on. Did you already have the entire story plotted out before taking this approach, or did you make it a challenge to surprise each other with unexpected twists and turns? JR: It’s not quite like that. We both go away to work on corresponding chapters and then at the end of the month we send them to each other for feedback. LT: We spend a lot of time together creating detailed character bios, plot outlines and chapter plans before we even start writing the book – we probably plan more than most solo authors might do, but you can’t improvise or it makes the other person’s version nonsense. Have you ever been tempted to pursue a solo writing project? LT: This feels right for us at the moment – we’re still enjoying it, and getting good feedback, and coming up with ideas that lend themselves to a dual-viewpoint format. But I reckon it’s fair to say we both see ourselves writing solo in our future. I think what we would write we be quite different – I quite fancy doing a psychological thriller or a gothic horror, but Jimmy has never let me turn our books into either of those. JR: She’s tried several times. As The Night That Changed Everything is your second novel, did you find writing it any easier? JR: We never knew the first book was going to get published, so we could take our time a bit more. Because we have a contract this time around, the whole thing felt less like a hobby. We definitely spent less time discussing what would be on the soundtrack if the book was ever made into a film. LT: We might have spent less time discussing it but I still spent time devising one. I’ll play it to you next time you’re over, Jimmy. I think we knew what we were doing a bit more this time round – we were clueless the first time, just shoehorning jokes in at the expense of moving the plot forward in any meaningful way – but I think we learned a lot this time too. Even though The Night That Changed Everything is only being published this week, can you already reveal what you’re working on next? JR: It takes ages for books to get published after you hand them in - there's covers and proofreading and marketing to think about. We handed in the final version of The Night That Changed Everything in late autumn, I think, and pretty much started thinking of ideas for book three straight away. We have an idea but we’re not revealing anything just yet! LT: Other than it’s slightly darker than our previous two. And the format isn’t quite so straightforward. But hopefully it will still be romantic and funny. Thank you very much Jimmy and Laura for your insightful and very funny answers! I really loved The Night That Changed Everything and I cannot wait to find out more about your next novel. 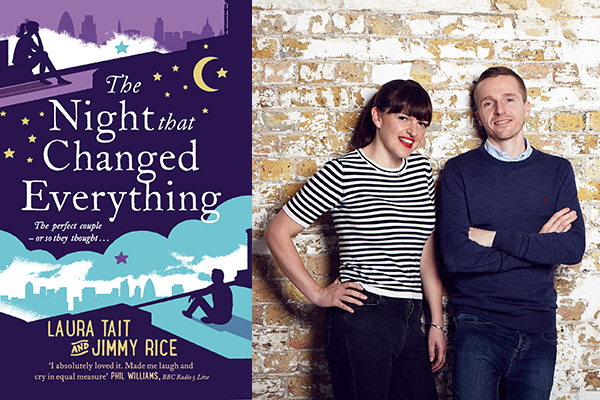 The Night That Changed Everything is published by Transworld on 24 March 2016 and you can pre-order your copy from Foyles, or your own preferred retailer now.